All breakfasts. All dinners. Dinner with entertainment at Le Terme del Colosseo on Day 6. 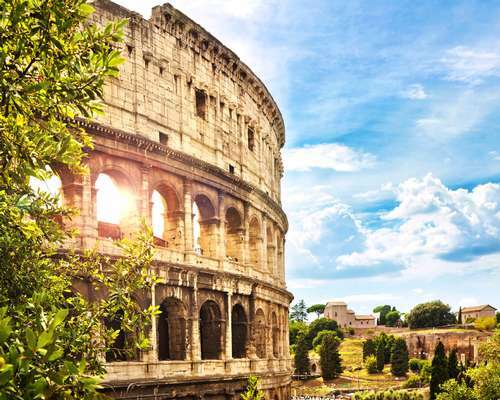 Rome is your destination; a wide-bodied jet is your vehicle. Swoop down over the Alps and touch down on the wide concrete runway at Fiumicino Airport. You've arrived in Italy! 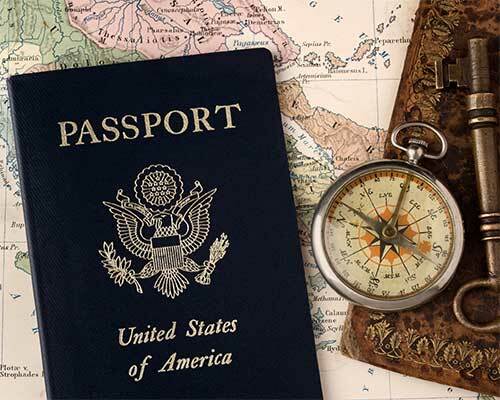 Proceed to your centrally-located hotel, settle in and get ready to explore your surroundings. 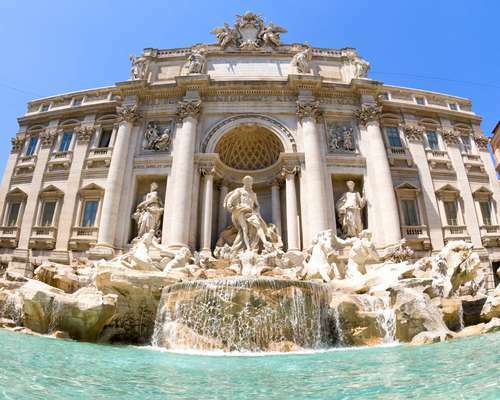 Set out on a sightseeing tour of Rome. 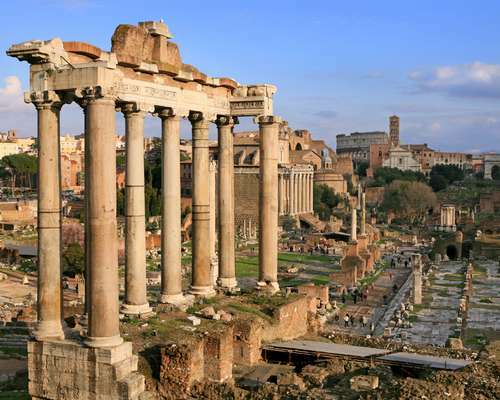 A full-day local guide, well-educated and specially-trained on the history and culture of Rome, will accompany your group. Today's excursion takes south of Rome. You will visit either the Catacombs of San Sebastiano or the Catacombs of San Callisto. It is said that at the dawn of Christianity, during the height of the persecution of Christians by the Romans, the remains of St. Peter and St. Paul were transferred to the Catacombs of San Sebastiano. A stone believed to bear a footprint of Christ is also held there. The Catacombs of San Callisto served as the official burial grounds for the first bishops of Rome. 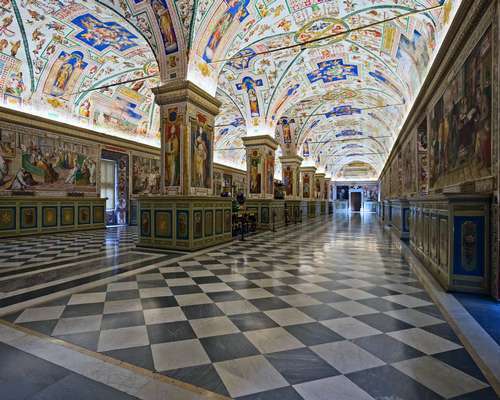 Its Crypt of the Popes houses the graves of early pontiffs. The volcanic Alban Hills region, set within the Parco Regionale dei Castelli Romani, includes two crater lakes and thirteen picturesque towns founded in the pre-Roman era of Ancient Latium. 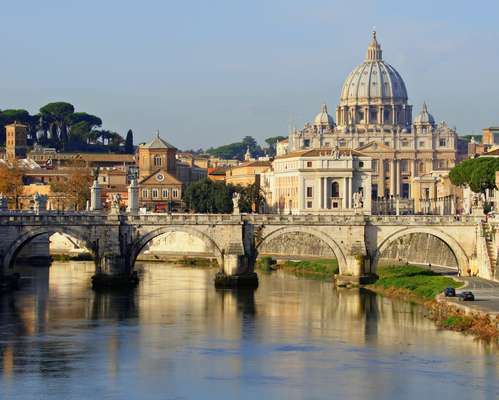 They are collectively called "Castles of Rome" because they were later chosen by popes and prominent Roman families as cool places (literally) to establish their summer country estates. Head up to the highest point of a town set on a long ridge above Lake Albano. It's said to occupy the site of the ancient citadel of Alba Longa, the mythical mother city of all ancient Latium towns, and, by extension, of Rome itself. Nowadays, its name, Castel Gandolfo, is synonymous with the official summer residence of the Pope: the Papal Palace, or Apostolic Palace, built in the 1600s on the site of one of the emperor Domitian's palaces. Explore the town which is perhaps the most elegant of the Castelli Romani with its villas and parks. Frascati is also widely known for its production of cheese, jams, and DOC white wines. Today, your coach takes you to the Assisi of St. Francis and St. Clare, where overflowing windowboxes adorn the ubiquitous pink stone buildings. A half-day local guide, well-educated and specially-trained on the history and culture of Assisi, will accompany your group. Step into the basilica built on the Hill of Paradise. It consists of two superimposed churches resting on a series of arches: the Lower Basilica, built over the crypt which contains the tomb of St. Francis, and the Upper Basilica, decorated with frescoes by 13th-century masters Giotto and Cimabue. Visit the Basilica of Santa Chiara, built in the 13th-century. In its Oratory of the Crucifix, you will see the miraculous 13th-century San Damiano Crucifix that spoke to St. Francis (the crucifix was in Assisi's Church of San Damian at that time). In the Crypt, view the tomb of St. Clare, who was St. Francis' contemporary and the founder of the Order of Poor Clares. Enter the Santuario de Santa Maria degli Angeli, which stands on the outskirts of town, to view the Porziuncola, the chapel where St. Francis prayed and received visions, as well as the Transitus Chapel built over the cell in which the beloved saint died in 1226. Enjoy some free time in Rome today.